Comic books used to be that band that played your favourite dingy dive, but couldn’t dream of booking an arena tour. Except now we’re a bunch of sweaty, muddy adults congregating around a festival mainstage, too afraid to say we just want to go home for fear of being seen as cranky borings, while Marvel and DC shoot cinematic adaptations at us like swag from a T-shirt cannon. So, accept this sentiment sincerely: thank you, ‘Shazam!’, for breaking through our superhero fatigue when we needed it the most. In the flood of regurgitated origin stories — and interpretations that are either too longwinded or too flimsy to hold up on the big screen — DC’s latest offering steps out of genre conventions to make us believe again. It has magic, wizards, growing pains and hard-earned friendships that will heal your soul. Set around Christmas time, David F Sandberg’s film has all the makings of a wholesome holiday classic, mixed with the family-friendly humour of mid 80s, early 90s adventure flicks and the well-rendered fantasy of a modern teen franchise. Think ‘Home Alone’, ‘The Goonies’ and ‘Harry Potter’ all rolled into one. The story follows Billy Batson (Asher Angel), an orphaned kid on the lam from yet another foster home, who only cares about finding the mother he lost in the crowd as a little boy. Batson is placed with the Vasquez family, who are as warm and inviting as he is disinterested. Victor and Rosa are former foster kids themselves, and their clan of oddball children — Freddy, Mary, Eugene and Darla – couldn’t be more different, except for how much heart they have. After an incident at his new school, Batson finds himself pulled out of the ordinary by the Wizard Shazam (Djimon Hounsou) and, to his total bewilderment, returned to the real world as an adult male superhero (Zachary Levi) in a puffy red suit and a lightning bolt emblem. Meanwhile, our villain Dr Sivana (Mark Strong) is a scorned researcher with potentially fatal grudges against his father and brother. He calls upon the seven deadly sins — reimagined as ghastly statues come to life — to do his dirty work. The good vs evil premise is simple here: Sivana must defeat Shazam before Shazam defeats him. This is where director Sandberg lets out his signature flair for horror, occasionally allowing the film to morph into a creature feature. Prior to ‘Shazam!’, Sandberg’s work almost exclusively focused on sci-fi and horror (‘Lights Out’, ‘Annabelle: Creation', plus a number of shorts posted under the pseudonym ‘ponysmasher’), and he again tests the limits of genre here to throw in a couple of unexpected jump scares. But, underneath all the action sequences and poofs of creepy debris, there’s an underlying message of what can happen when one person is deprived of a family’s love from an early age, while another flourishes under newfound acceptance. ‘Shazam!’ successfully avoids several pitfalls of contemporary superhero films, but it does tragically suffer from the overlong final third. The battle scenes feel particularly jarring in this case, since ‘Shazam!’ had been such a different kind of film up until that point. Suffice to say, Sandberg could have shaved off a healthy few minutes without sacrificing emotional pay-off or overall integrity. Nonetheless, ‘Shazam!’ shines thanks to its committed cast, and credit must be given to casting director Rich Delia for his lesser known finds. For whatever reason, the film has been mostly marketed as a Zachary Levi flick — but while Levi is indubitably brilliant as a teen boy stuck in a grown man’s body, this is a group triumph. Angel brings a boyish sensitivity to Batson, a teen forced to grow up too fast, that elevates the film’s more emotional mileposts, while Grazer, whose character uses a crutch to walk, presents the ache of a loner who dreams of flying — and the familiarity of the scrawny, outgoing outcast who won’t let the resident bullies get him down. Faithe Herman is an adorable addition as the overly talkative younger sister Darla, while 12-year-old Ian Chen as Eugene blesses us with his deadpan delivery that we have come to expect from him since his appearance on the sitcom ‘Fresh Off the Boat’. Put all these — and many, many more — together, and you won’t know where to focus your affections. In a story that’s clearly about finding strength in your chosen family, actual superpowers become secondary, if not tertiary to the point. And maybe the moral is that that’s been the most important superpower all along. 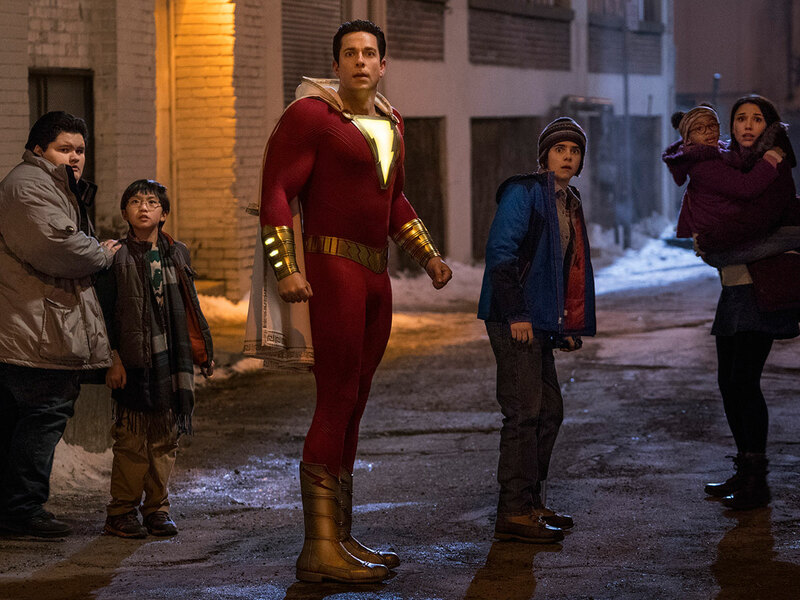 ‘Shazam!’ releases in the UAE on April 4.